Over the past five years the major importance of cytokines in the regulation of the immune system has become established. 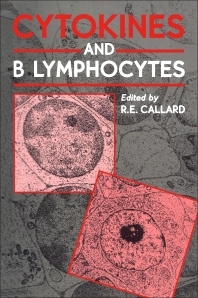 This book is the first to review the role of these factors in the control of growth of differentiation of B lymphocytes and thus represents an up-to-date and timely overview of the B-cell response. For the immunologist, there are detailed accounts of the physio-chemical properties of the relevant cytokines and their effect on B lymphocytes from the level of receptor signalling, through ontogeny, activation and proliferation to the expression of specific immunoglobulin isotypes. For the clinician, the involvement of cytokines in disease and normal immune response is discussed. R.E. Callard, A. Gearing, and R.J. Armitage, The Physiochemical Properties of B-Cell Growth and Differentiation Factors and Their Receptors. K. Rigley and M. Harnett, Receptor Signalling in B Lymphocytes. T. DeFrance and J. Banchereau, Role of Cytokines in the Ontogeny, Activation and Proliferation of B Lymphocytes. R.J. Armitage, K.H. Grabstein, and M.L. Alderson, Cytokine Regulation of B-Cell Differentiation. V.M. Sanders and E.S. Vitetta, Collaboration between T and B Cells. J.M. Teale and D.M. Estes, Immunoglobulin Isotype Regulation. J. Gordon, Autocrine Aspects of the B-Lymphocyte Regulation. S. Romagnani, Cytokine Action on B Cells in Disease. J.G. Shields and J.Y. Bonnefoy, B-Cell Assays for Growth and Differentiation Factors. Index. Institute of Child Health, University of London, U.K.